Some people dream of making an impact, a few talk about making an impact, most want to make an impact, and then there are the ones that do make an impact. Sheneka Brown, author of “Dear Little Brown Girl: My Travels Around the World” is definitely doing the latter. Impacting children has been Sheneka’s life’s work. Sheneka is a reading teacher, who is currently pursuing her Ph.D., and uses reading as a way to encourage child literacy and as a tool to take them places they have never been. Through literature, Mrs. Brown is influencing little brown girls all over the world. Dear Little Brown Girl follows a young brown girl, named Chloe`, who dreams of becoming the President. She travels around the world, meeting with world leaders to gain insight on things happening around the globe. Dear Little Brown Girl touches on geography, history, diversity, and equality. What makes this book even more spectacular is that it is all facts and not fake news. I chatted with Sheneka about her fabulous book and about her experiences as a little brown girl. Keep reading for more on what Mrs. Brown had to say. 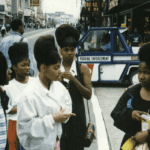 Tynee` Sims: Why do you want to empower Brown Girls? Sheneka Brown: I want to empower brown girls with my book so that they can see positive images. I want them to be able to see strong women in leadership, like the main character Chloe`, who goes around the world meeting with Heads of State. I want them to know about the many women around the world who hold leadership positions in their respective countries. Tynee`: Dear Little Brown Girl is about traveling and exploration. How important is it for brown girls to travel? Sheneka: Travel is important because as black people, we do not get to do it as often as our counterparts do, due to economic reasons. Little brown girls need to travel, because they need to know that there is so much more to the world than what they see in front of them. Traveling will give them a chance to experience other people’s cultures, languages, and food. Tynee`: Geography, history, diversity, and equality are all running themes throughout the book. Why should children learn those things at early ages? Sheneka: If you do not know where you have been, then you do not know where you are going. You need to know these things in order to move forward in life. Tynee`: How important was literacy in your home when you were growing up? Sheneka: Growing up, literacy was a focus in my home. My Mother was a Community Involvement Specialist in our local school district, and she believe in having her children read all the time. My siblings and I had to read the books and then give my mother a full-length synopsis. Our television time was very limited. Tynee’: Why are you so passionate about literacy? Sheneka: I am passionate because I know that reading can take you anywhere. My passion comes from working in an inner city school. I see every day, how literacy changes lives. Statistics show that if children, are not fluent in reading by middle school, they are more than likely going to drop before the 12th grade. Once I started seeing 5th grade students reading at a first grade level, I knew that I had to do something close the reading gap. In the midst of getting ready to do a dissertation for my Ph.D., I realized that African-Americans are at the bottom of the literacy totem pole, and it is my purpose to get us to the top. Literacy is a direct correlation to the school to prison pipeline. Therefore, I want to use my book as tool to reduce children from going to prison. Tynee`: As a little girl, where did you want to travel to the most? 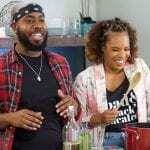 Sheneka: Los Angeles, California! I will be going there for the first time in November during my book tour. 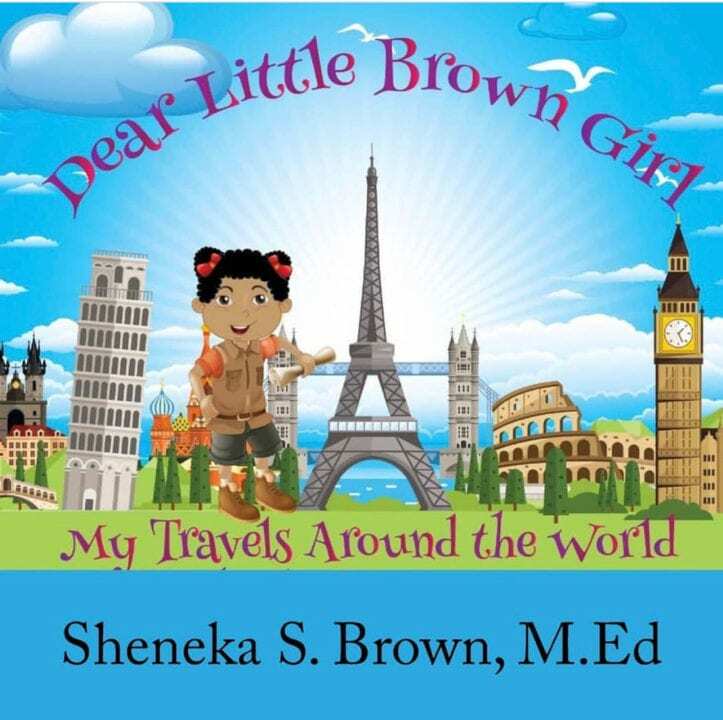 “Dear Brown Girl: My Travels from around the World”, has been endorsed by multiple NFL Players such as: NFL Hall of Fame Finalists Edgerrin James, Reggie Wayne, Tony Carter, Kevin Burnett, Janoris Jenkins, Raymond Griffin Sr., and Angela Stanton. 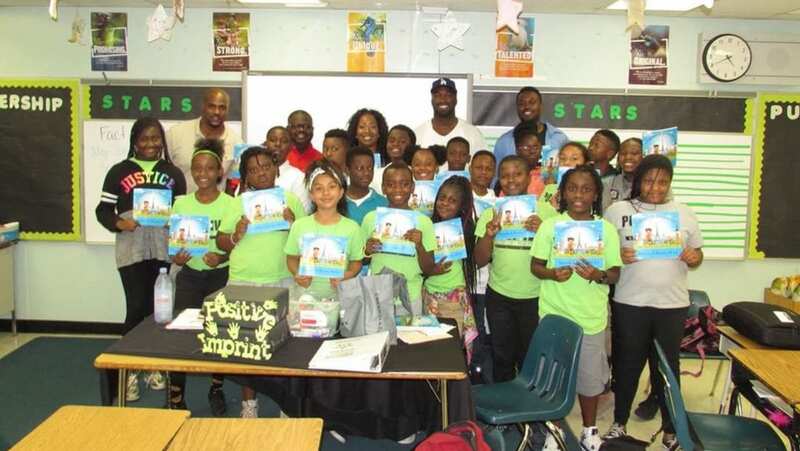 In addition, the book has been featured on NBC, 103.5 The Beat FM (Miami), and WMBM 1490 AM Radio Stations. “Dear Brown Girl: My Travels from around the World” is available on Amazon, Barnes & Noble, Books-A-Million, and everywhere books are sold. 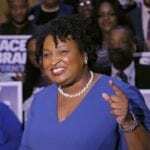 The book is also located at College Park Library in Atlanta, Georgia as well as Uniondale Library in Long Island, New York. Connect with Sheneka Brown on Twitter for more news and future release!